In this post we are featuring photos from both the June and July 2016 NORBAG workshops. 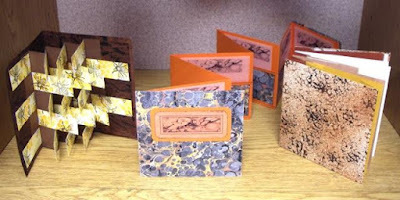 Bobbie Hayes conducted the origami fold "wallet book" workshop in June and so didn’t have a chance to take photos. At that workshop we were fortunate to have Lara Cox show examples of her kirigami which is a variation of origami that includes folding and cutting paper. In addition to her exchange book, she brought two hats inspired by 1920's era fashion. The various fold elements include free form flowers as well as spiral cuts and a kirigami fishnet to partially cover the face. 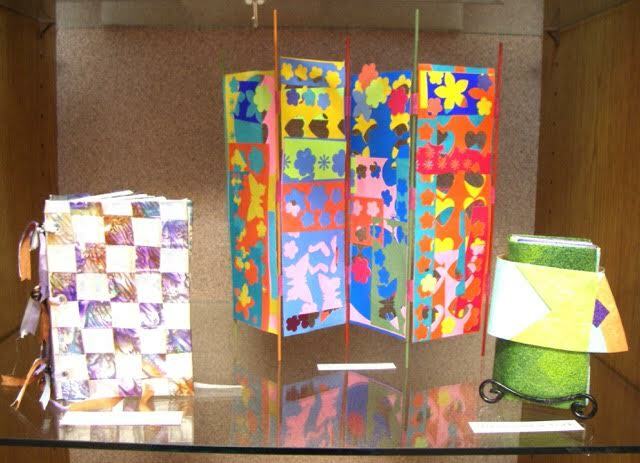 The photos below show Lara's beautiful examples of "kirigami fascinators". 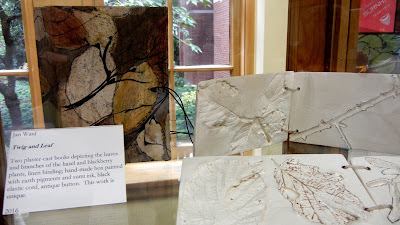 The July workshop, titled "Sculptural Leporello", was taught by Michele Kamprath. A leporello is an accordion-like structure that can be of any number of pages. 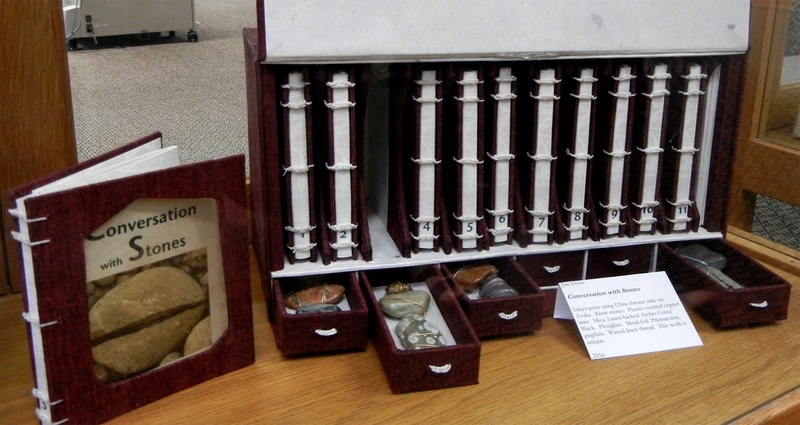 Take a look at all of the variations! 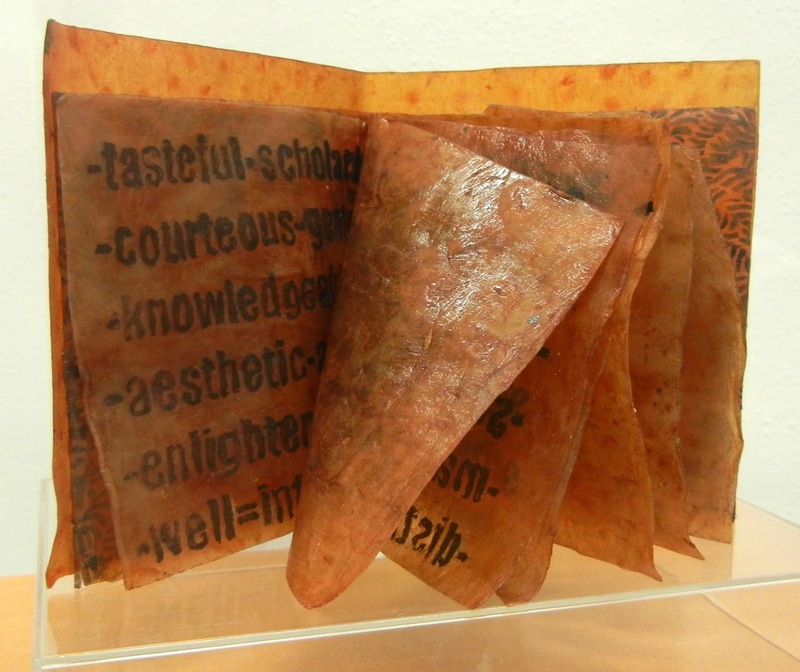 There are two basic components of the leporello. The pink is the card with a single "V" fold and the green/pink is the same size card that is folded into a "W" and collapses inside the single fold. 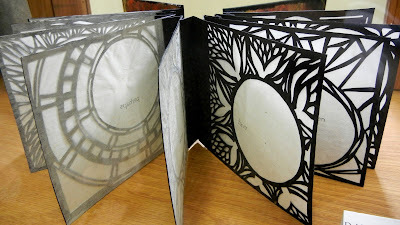 The outer "W" fold can be cut, stamped or decorated in almost any manner. There is a new display of NORBAG artist's books in the kiosk at the Humboldt County Library. This display features different methods of surface design. 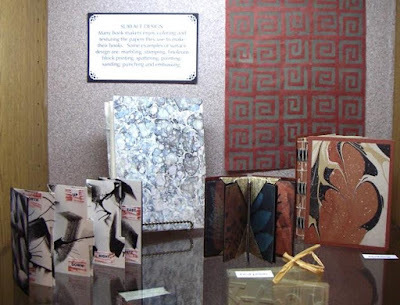 According to the sign in the display, surface design refers to the methods artists use to color or decorate the papers in their books. 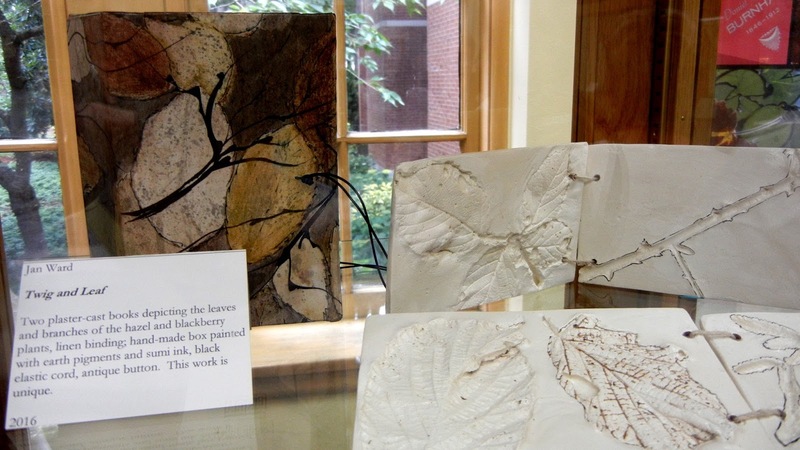 Some examples of this include marbling, stamping, painting, linoleum block printing, spattering, sanding, sponging, and embossing. 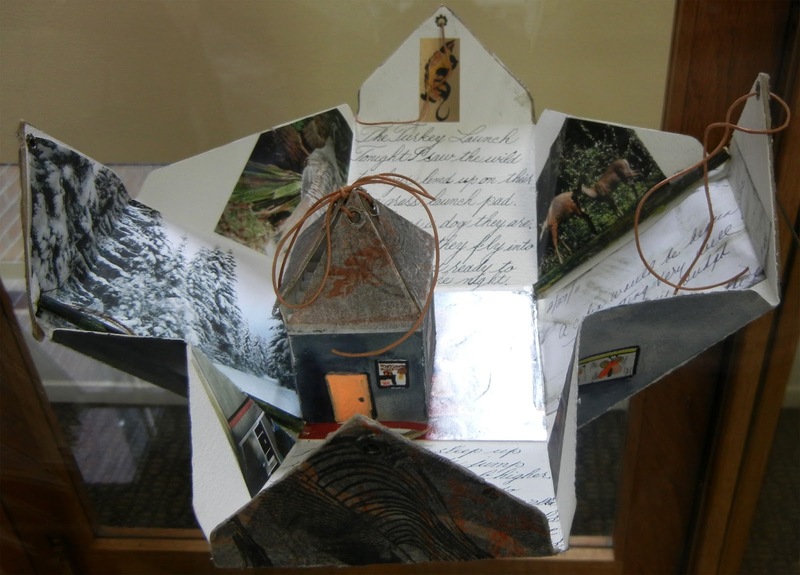 This display will be up until early September so if you're in Eureka stop by to check it out. 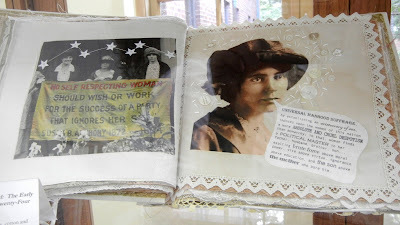 Thank you to Lynne Gurnee for arranging the display and providing the photographs. 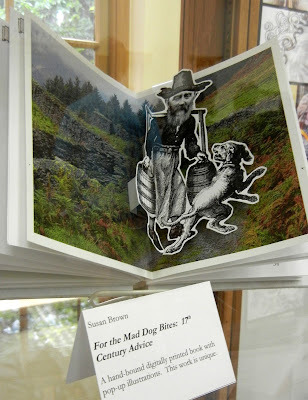 The Puget Sound Book Artists Sixth Annual Members' Exhibition is on-going at Collins Memorial Library on the campus of the University of Puget Sound in Tacoma, Washington. There are 60 works by 38 artists in this exhibit that opened June 2 and runs through July 30. 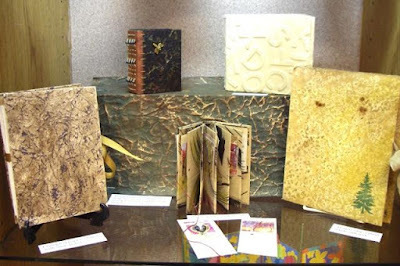 The exhibit features a wide variety of book forms including some that are quite sculptural. There are also some very unique materials, methods of assemblage, and bindings used. 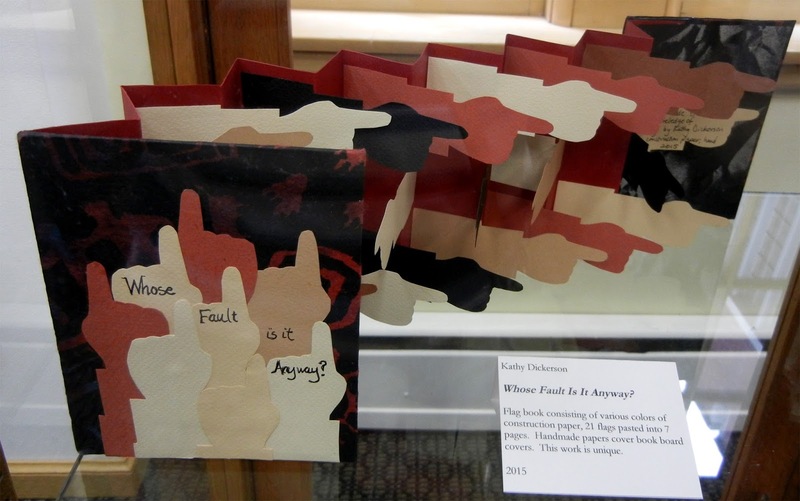 More information about the exhibit can be found at the Collins Library website where you can access photos of all the books from the links on the right hand side of the page. 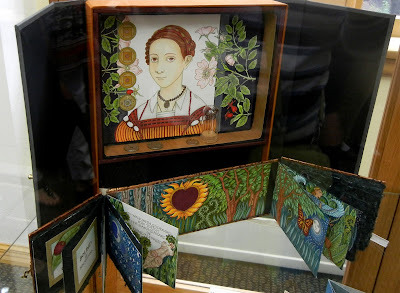 http://www.pugetsound.edu/academics/academic-resources/collins-memorial-library/about-collins/artwork-exhibits-in-the-library/psba-sixth-annual-members-exhibition/. Also, check out PSBA's blog for more information about this busy organization at: http://blogs.pugetsound.edu/pugetsoundbookartists/. 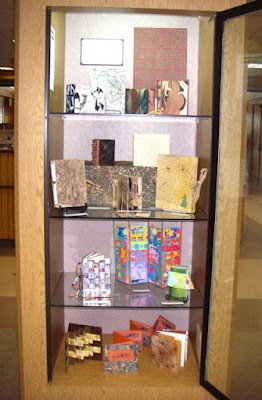 Here is a sample of some of the wonderful books in the exhibition.